Cast members from ‘Newsies’ at Toby’s Dinner Theatre. Photo by Jeri Tidwell Photography. “When you got a hundred voices singing, who can hear a lousy whistle blow? And the world will know…” These rallying lyrics, as sung by Newspaper Boys or “Newsies,” from Disney’s musical of the same name, reminds me of the brave youth who recently made their voices heard to the world during the recent March for Our Lives rally in Washington, DC. 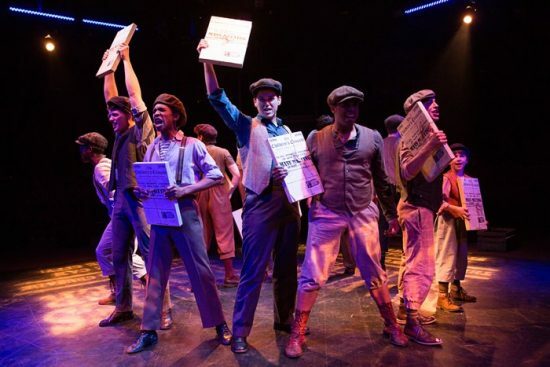 Toby’s Dinner Theatre’s timely and exhilarating production of “Newsies” is about the real-life Newsboys Strike of 1899 in New York City. The story is centered around Jack Kelly, the leader of the Newsies, (played by a passionate and charismatic Matt Hirsh) who organizes a protest when he discovers that the boisterous publisher of the New York World, Joseph Pulitzer (played to perfection by Russell Sunday) raised the cost of the newspapers, making life even more difficult for the Newsies, many of whom are orphaned and homeless. A young reporter with a secret named Katherine Plumber (a strong-willed MaryKate Brouillet) decides to write a news story about the protest as an opportunity to be seen as a more serious female journalist. During the course of the story we also meet Crutchie (played with heart by Taylor Witt), Jack’s friend, who walks with the aid of a crutch due to a bad leg; Davey (a strong and smart Harrison Smith), and his younger brother Les (a fearless Cooper Trump) who were raised in a home and educated unlike the other Newsies; and Medda Larkin (played by a lovably risque Kadejah Oné), a vaudeville star of the Bowery variety. …a timely and exhilarating production that is not-to-be-missed! Co-directors Toby Orenstein and Mark Minnick team up to create and develop a timely and exhilarating production that is not-to-be-missed! Choreographer Ilona Kessell brings vigor and bravado to the Newsies while musical director and orchestrator Ross Scott Rawlings adds a bold and bouncy feel to the music with the much appreciated live band. “Newsies” plays through June 10, 2018, at Toby’s the Dinner Theatre of Columbia— 5900 Symphony Woods Road in Columbia, MD. For tickets call the box office at (410) 730-8311, or purchase them online.